Subject Tests are designed to measure your knowledge and skills in particular subject areas, as well as your ability to apply that knowledge. Students take the Subject Tests to demonstrate to colleges their mastery of specific subjects like English, history, mathematics, science, and language. The tests are independent of any particular textbook or method of instruction. The tests' content evolves to reflect current trends in high school curricula, but the types of questions change little from year to year. The Literature Subject Test measures how well you have learned to read and interpret literature. There are six to eight sets of questions on the test, each based on a different literary text. The examination usually contains about 60 multiple-choice questions. The United States History Subject Test assesses your knowledge of and ability to use material commonly taught in U.S. History and social studies courses in high school. The examination usually contains about 90~95 multiple-choice questions. The World History Subject Test measures your understanding of key developments in global history and your use of basic historical techniques. Basic techniques include the application and weighing of evidence and the ability to interpret and generalize. The examination usually contains 95 multiple-choice questions. Mathematics Level 1 is a broad survey test intended for students who have taken three years of college-prep math: two years of algebra and one year of geometry. Mathematics Level 2 is a broad survey test intended for students who have taken college-prep math for more than three years: two years of algebra, one year of geometry, and trigonometry and elementary functions (pre-calculus). The Biology E/M test assesses your understanding of general biology at the college preparatory level. The Biology E/M contains a common core of 60 general-knowledge multiple-choice questions, followed by 20 multiple-choice questions that emphasize either ecological (Biology E) or molecular (Biology M) subject matter. After completing the core questions, test takers choose the section for which they feel most prepared. On test day you'll indicate if you're taking Biology-E or Biology-M by gridding the code for the chosen test on your answer sheet. Only questions pertaining to the test code that is gridded on the answer sheet will be scored. You may not take both Biology-E and Biology-M on the same test day. The chemistry test assesses your understanding of general chemistry at the college preparatory level. The examination usually contains 85 multiple-choice questions. Please Note: Due to the differences in high school chemistry courses, you may find that some questions are on unfamiliar topics. The examination usually contains 75 multiple-choice questions. Please Note: Due to the differences in high school physics courses, it is likely that most students will find that some questions are on topics they are not familiar with. The Language Subject Test evaluates your ability to communicate the each language in a culturally appropriate manner. This test measures your ability to comprehend both written and spoken Language. Students taking these tests are required to bring an acceptable cassette player with earphones to the test center. Offered only in November at designated test centers. 문학 시험은 문학 작품의 독해 능력을 평가하기 위한 시험이므로 시험을 훨씬 효율적으로 대비하기 위해서는 여러 시대의 다양한 장르의 작품을 읽고 이해할 수 있는 능력, 기본적인 문학 용어에 대한 지식 등을 필요로 합니다. 학원에서는 SAT Writing essays 의 연장수업으로 더 많은 고등학교 Book list 에 나오는 다양한 소재의 작품들을 꾸준히 읽고 작품에 대한 토론 수업을 합니다. 미국 역사 시험은 콜럼버스 이전 시대부터 현재까지의 미국 역사, 정치, 경제, 사회, 문화 전반에 관한 교과서수업내용의 이해능력을 평가한다. 미국역사의 주요시대별 흐름을 깊이 있게 가르침으로 하면 시험 준비뿐만 아니라 대학기초교양과목의 준비까지 할 수 있습니다. Math Level 1은 algebra, geometry (three-dimensional and coordinate), trigonometry, functions, statistics, including probability, permutations, and combinations miscellaneous topics, including logic and proof, elementary number theory, sequence limits 의 내용에서 Math Level 2는 Math Level 1의 범위와 calculus에서 출제합니다. 시험내용은 짧은 시간 내에 얼마나 많은 정보를 얼마나 정확하게 알고 있는가를 Test하므로 많은 유형의 문제를 빠른 시간 내에 풀어보고 실수를 하지 않도록 연습을 많이 하는 것이 가장 적합 합니다. 대부분 한국학생들에게는 큰 어려움 없이 풀 수 있는 문제이며 문제풀이에 TI-84계산기만 있어도 충분하다. 평소에 수학용어와 기본개념을 충실히 공부하면 고득점을 받을 수 있습니다. 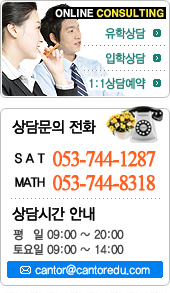 학원에서는 9, 10, 11학년을 대상으로 4명이내의 소수반을 편성하여 MATHⅡC, AP calculus 수업을 합니다. 과학과목 시험은 고등학교 수준의 생물교과에서 배운 주요이론에 대한 개념이해와 주어진 실험정보를 바탕으로 결론을 유추하는 응용문제해결력을 평가합니다. 각 고등학교의 수업내용이 상이한 부분도 있어 다루지 않았던 내용이 출제 될 수도 있습니다. 전문학술용어가 많이 나오므로 과목별 내용을 체계적으로 정리요약해 두어야 한다. 자기가 자신 있는 분야의 과목을 선택하여 시험을 응시하고 과목별 시험시간은 1시간이며 생물 E/M 시험은 객관식 문제 80문항 중 60문항은 공통문제이고, 20문항은 생태학 관련 문제(생물-E) 또는 분자생물학 관련 문제(생물-M)이다. 둘 중에서 더 자신 있는 분야를 골라 문제를 풀 면 된다. 화학 시험은 객관식 문제 85문항, 원소 주기율표는 시험지에 수록, 모든 계산문제는 계산기 없이 가능한 단순 계산 문제입니다. 물리 시험은 객관식 문제 75문항이 출제된다. 학원에서는 각 과목별 전공 선생님이 4명이내의 소수반을 편성하여 수업을 합니다. 우편접수시 한미교육위원단(�­울시 마포구 염리동168 - 15번지 Tel: 02-3211-1233) 에�­ SAT Bulletin 을 수령하여 우체국 전신환증�­(한미은행 전신환율만 인정)와 신청�­를 동봉하여 SAT College Board 로 송부. 등록 마감일은 미국의 경우 우편소인이 찍힌 날짜이며, international의 경우 우편수령날짜입니다. FAX로 접수할 수도 있는데, 인터넷 사이트 (www, collegeboard.com)로 신청사항을 정확히 입력하고 VISA, Mater card 등으로 응시료를 결재하는 것이 일반적입니다.